LiveU supplied live IP streaming solution for Wings for Life. Hackensack, NJ, June 2018: LiveU was the key live streaming provider for the Wings for Life World Run production this year, one of the most challenging live sports productions in Europe. LiveU deployed almost 100 transmitters including LU600 HEVC portable transmission units and LU-Smart mobile apps to live stream the seven-hour annual race taking place simultaneously in 34 locations around the globe. The Wings for Life World Run is a global charity event supporting life-changing spinal cord research projects with a unique, moving finish line; the “Catcher Car”, chases runners along the course, gradually getting faster until each one is caught. The first runners passed after a few kilometers are the first to celebrate their accomplishments, while the last man and woman to be caught are declared Global Champions. The race takes place in different locations around the globe at the same time, which can be morning, noon, afternoon, or evening, in the respective countries. Over half a million participants have taken part in the event since the first Wings for Life World Run in 2014. 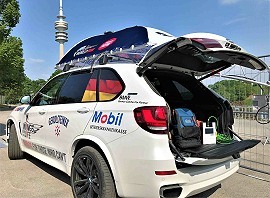 The LiveU units were used in numerous locations, covering the flagship runs and most of the organized App runs, while using LiveU HEVC technology in extreme conditions – on-the-move from motorcycles and inside the catcher car. Video was streamed worldwide via the local production teams and Wings for Life World Run Salzburg headquarters. The LU-Smart app was used to supply unique content from some of the athletes taking part in the race.